In the late spring of 1945, in some of the bloodiest fighting of World War Two, Allied forces move north through Italy, liberating towns from Fascist control. Italy’s leader, Benito Mussolini, is in hiding. A deadly cat and mouse game unfolds as members of the American spy service, the OSS, hunt for Mussolini, to try him as a war criminal. But Il Duce has terrorized Italians for twenty one years – and the US Military are in a race with Italian Partisans who want vengeance. 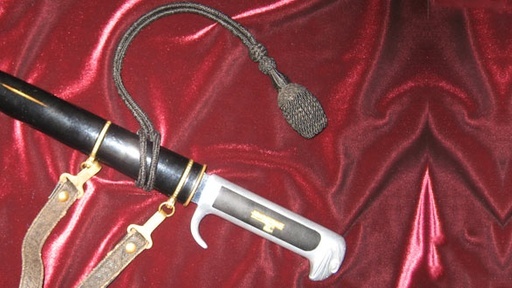 Jerry Steichen, of Reno, Nevada, has a weapon which he believes may be connected to the last days of the world’s first fascist state. Jerry wants to know if a dagger his uncle brought back from the war belonged to Mussolini himself. Related Investigation Our Colored Heroes Is this a WWI recruitment poster... or something else? Related Investigation Siberian Bullet What can this bullet reveal about the hidden agenda of American forces in a fight against Soviet Communism? Also with Wes Cowan Snowshoe's Mailbag Was this the satchel Snowshoe Thompson used to deliver his mail? Also in Depression and WWII: 1929-1945 King Kong Camera Was this old movie camera used to film the original version of King Kong?